2 Day Imlil & Imnane Valley Trek Client Comments, Reviews and Testimonials. 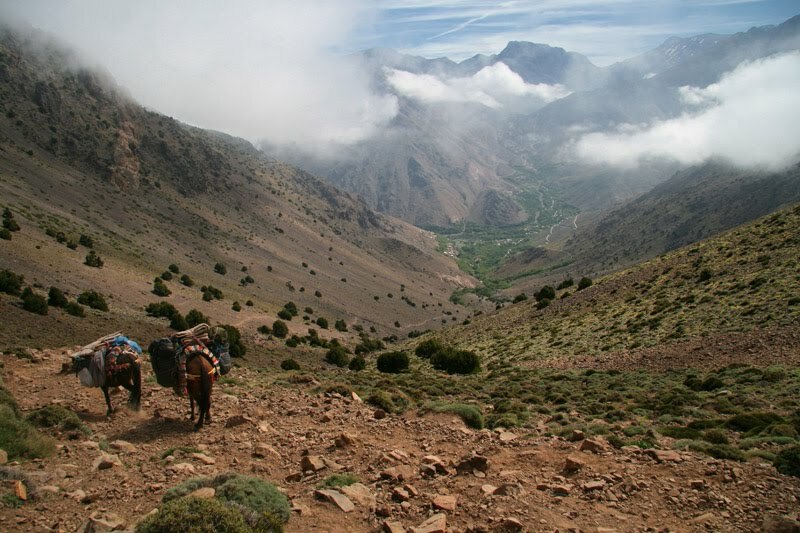 Book 2 Day Imlil & Imnane Valley Trek Today with Hip Marrakech - specialists in English Speaking Accommodation in Marrakesh, Morocco. "An exploration of Berber villages in the High Atlas Mountains..."
A 2 day 1 night exploration of Berber villages in the High Atlas Mountains. This is a very popular Atlas Mountain trek suitable for most people of average fitness. After picking you up from your hotel in Marrakech, we leave the city driving south towards the craggy peaks and plunging valleys of the Toubkal Massif. Crossing the Haouz Plain we pass through the tiny town of Asni, from where our road begins to climb towards the foothills of the Massif. Below us the valley of the Oued Rhirhaia stretches out into the distance and small villages cling to the sides of the steep hills as we meander our way towards the village of Imlil. Here we leave our vehicle and, in the company of our mountain guide, begin our trek, heading east across the winding mule tracks towards the Tizi n’ Tamatert (2279m). From here you will see locals from the small Berber village collecting small bushes for firewood and, in the distance, the snow-capped Jbel Oukaimeden, Africa’s premier Ski resort.After lunch we begin our descent down to the picturesque Imnane Valley where we will spend the night in a local gite – small, simple guesthouses situated right in the heart of traditional Berber villages. After an early breakfast we set off down the Assif Imnane Valley, passing through several traditional Berber Villages. This offers a perfect chance to see the peaceful mountain life first hand; an experience set in direct contrast to the hustle and bustle of Marrakech Medina. We then ascend to the Tizi 'n Aguersioual (2000m) which offers yet more stunning panoramic views. Once we pass the col, we then head down more winding mule tracks leading to the village of Aguersioual. Here we will rest and eat lunch, before returning to Imlil where a car is waiting to take us back to Marrakech.